"FPSO Espirito Santo", during conversion in Jurong, Singapore 2008. 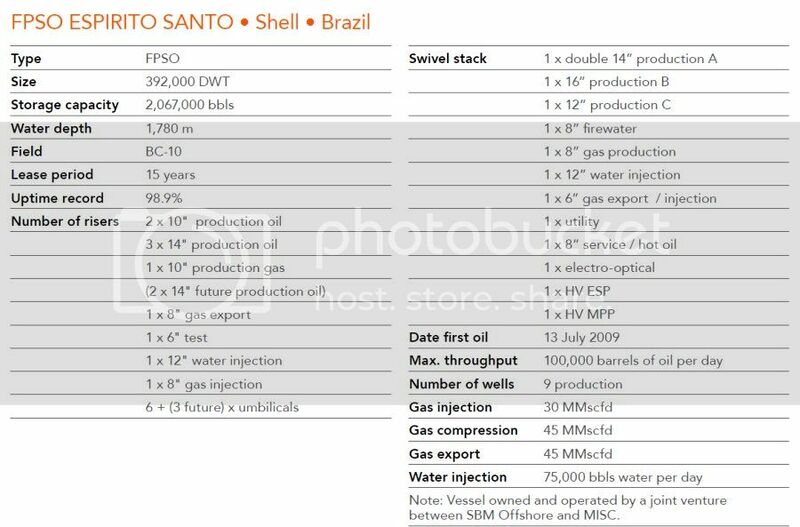 "FPSO Espirito Santo", at Pampo Oilfield, Brazil, July 6th, 2014. 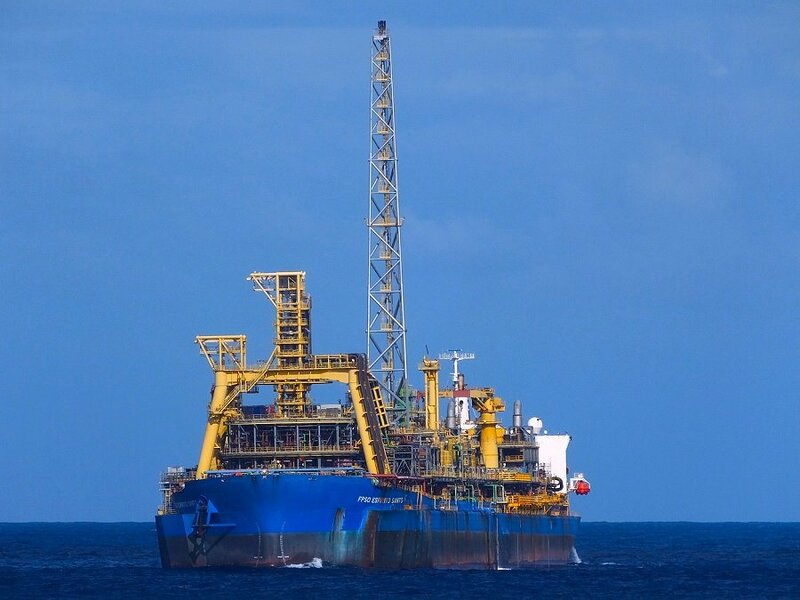 SBM Offshore N.V. and its joint venture partner MISC report that the FPSO Espirito Santo which was completed in Singapore in early November, has now arrived in Brazil. 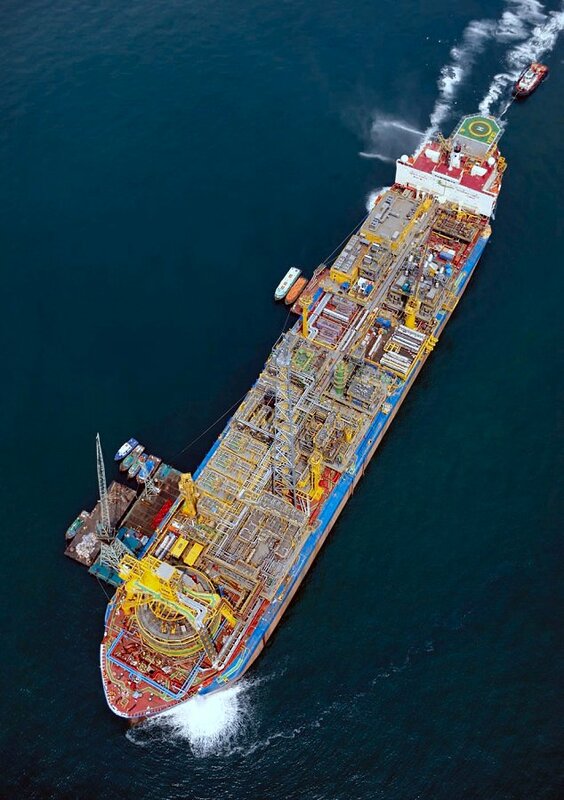 The FPSO, which is part of the BC-10 deepwater development in the Campos Basin offshore Brazil, will be hooked up to the anchoring system in 1,780 m of water depth followed by installation of the subsea flow lines, risers and umbilicals. 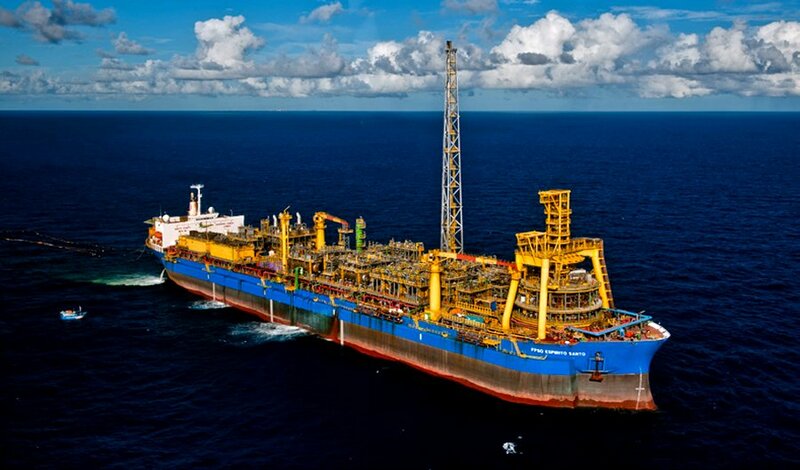 The FPSO is to be chartered by the BC-10 Joint Venture, which is operated by Shell with ONGC Campos Ltda. and Petrobras, under a long term lease and operation contract for the BC-10 deep water field development. 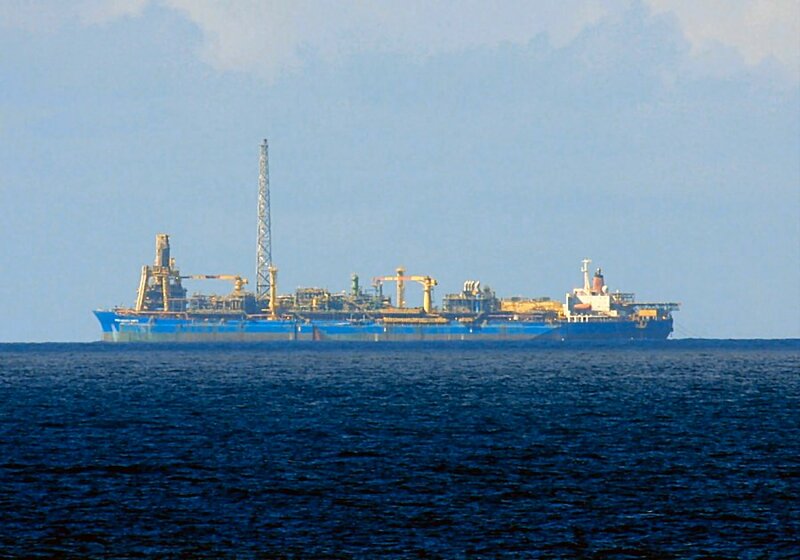 The FPSO is designed to produce 100,000 barrels of oil with gravity ranging from 16 degrees API to 42 degrees API, and to treat up to 45 MMSCFD of gas for injection or export. It will be the deepest FPSO of the SBM fleet and the first turret moored FPSO in the world using steel catenary risers for fluid transfer. All project activities: engineering, procurement, project management, construction supervision and commissioning were performed using in-house personnel from the SBM Offshore Group. SBM Offshore in joint venture with MISC will also operate the unit offshore Brazil. 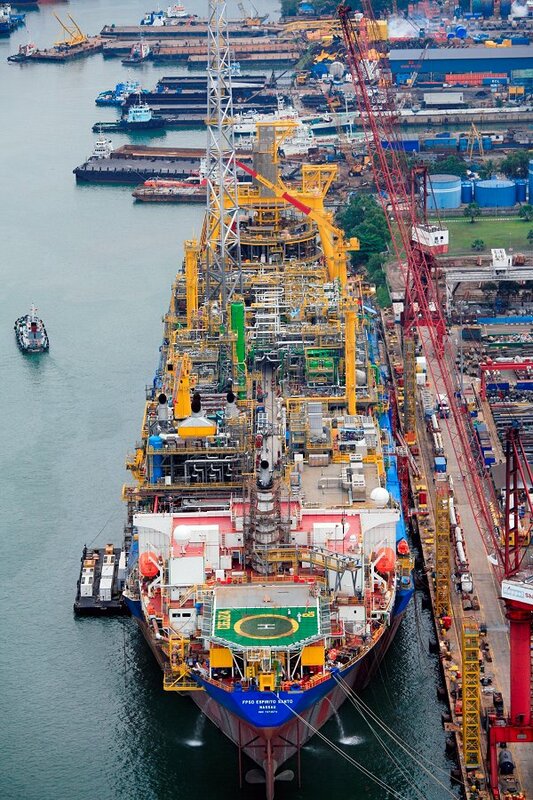 Vessel refurbishment and conversion including turret and topsides integration were performed in Singapore, during a 19 month period in the Keppel Tuas shipyard. Keppel achieved an outstanding safety record by performing more than five and a half million consecutive manhours without an LTI (Lost Time Incident) on this project. Together with the Singaporean topsides modules fabricators, the project has achieved a total of more than eight million consecutive manhours without an LTI. 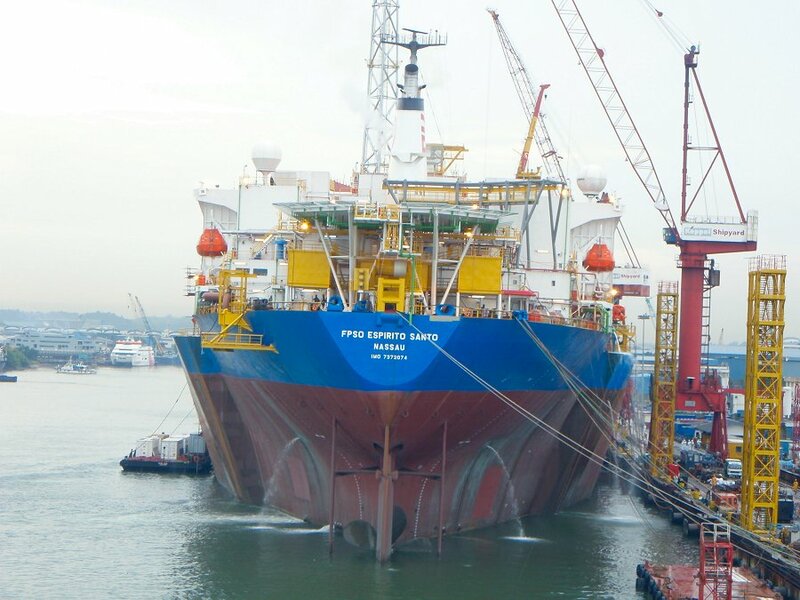 Mr. Tony Mace, Chief Executive Officer of SBM Offshore said, "We are very pleased with the safe arrival of the FPSO in Brazil following timely completion of the FPSO by Keppel in a very demanding market. We still face a challenging couple of months during offshore installation and hook-up, but we look forward to working with Shell to achieve the safe start-up of the unit. FPSO Espirito Santo will be our fifth operational FPSO in Brazil, and reinforces our position as the leading FPSO contractor in Brazil." The Miramar Ship Index for "KAZUKO"